Meningococcal is a rare but life threatening disease. A free meningococcal ACWY vaccine is available for children aged 1 to 4 and young people 15 to 19 years of age. Vaccines will be delivered through schools, community health centres and immunisation clinics. Parents of infants aged less than 12 months in WA who have already commenced, but not completed, a course of privately funded vaccination with Menveo vaccine, should contact their immunisation provider to receive the next vaccination. What MenACWY immunisation programs are available? 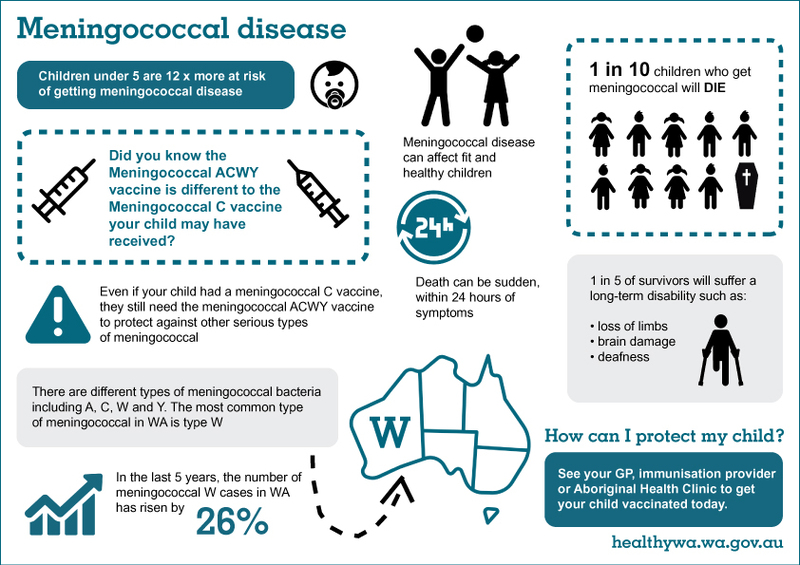 The MenACWY vaccine will help protect against meningococcal types A, C, W and Y. Year 10 students will receive their vaccination at school. Read more about the year 10 school-based immunisation program. Adolescents aged between 15 and 19 can also continue to access the vaccine until further notice by visiting their GP, Aboriginal Medical Service or community immunisation clinic (consultation fees may apply). The WA childhood program will offer free MenACWY vaccine to children aged 13 months to less than 5 years and Aboriginal children from 6 weeks to 12 months. Children who turn 12 months of age will be able to receive the free vaccine at their 12 month visit. Other children aged 13 months to less than 5 years can contact their immunisation provider to schedule an appointment for their child to get the MenACWY vaccine. Why use the MenACWY vaccine? Meningococcal disease type W was the type responsible for most of the recent cases in WA in 2017. The MenACWY vaccine protects for type W meningococcal disease and also for type Y, which is increasing in the community. In addition, the vaccine protects against type C, already in the national childhood immunisation schedule, and type A, a type rare in Australia. This vaccine does not protect against type B meningococcal disease. Which vaccines will be used? Two brands of the MenACWY vaccine will be used. Both vaccines, Nimenrix® and Menveo® protect against the four types of meningococcal bacteria A, C, W and Y and are similar in terms of safety and efficacy. Nimenrix® can be given as a single dose to persons from age 12 months. Menveo® can be given as a single dose to persons aged from 2 years. Nimenrix® will be used for children aged 12 months to less than 2 years of age and Menveo® will be used for children aged from 2 years and adolescents. Aboriginal children aged 6 weeks to 12 months and all other children aged 13 months to less than 5 years can contact their immunisation provider to schedule an appointment for their child to get the MenACWY vaccine. Calling ahead for an appointment is important so the provider can make sure they have the vaccine in stock and available. This catch-up program will end on 31 December 2019. Year 10 students will be offered the free MenACWY vaccine at school during 2018. Consent forms will be sent home prior to vaccination day. 15 to 19 year olds who have not received their free MenACWY vaccine can still get it by contacting their immunisation provider (consultation fees may apply). People who plan to travel or live in parts of the world where meningococcal disease is common, such as parts of Africa, or people participating in mass international gatherings such as the Hajj in Mecca. Some countries require provide evidence of vaccination for entry visas. Laboratory personnel who frequently handle Neisseria Meningitis. Household or sexual contacts of a case. People considering immunisation should seek advice from their local doctor or a travel doctor. Is the MenACWY vaccine safe and effective? Studies have shown that the effectiveness of the meningococcal ACWY vaccine is between 80 to 85 per cent. Studies have also shown that the vaccines used in the WA childhood meningococcal ACWY vaccination program are safe to use in children and adults. As with any vaccine, there may be some mild side effects. These include injection site pain, redness and swelling, myalgia, headache, nausea, loss of appetite and fever. Serious vaccine reactions are similar to those of other childhood vaccines and are very rare. The MenACWY vaccine can be safely administered in either the upper arm or the upper thigh, depending on the age of the vaccine recipient. Please contact your immunisation provider for details or to make an appointment. Vaccines are available at Aboriginal Medical Services (external site). School immunisation teams will offer the vaccine at school. Schools will send out consent forms prior to immunisation day. public health unit (regional areas). Those not eligible for the statewide program (ages outside 15 to 19 years) may purchase the vaccine privately from their GP or Aboriginal Medical Service. For vaccination information you can contact your local immunisation provider or public health unit.